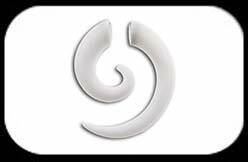 Magnetic Ear Spiral, 6mm white acrylic. Does not need a piercing, held in place by magnet. Magnetic Spirals are sold as single spirals (1 piece). For a pair, please order 2 pieces.